Stripped of its diplomatic language, did Adam Putnam just call RONALD DEON DeSANTIS a Koch Brothers puppet, or in North Florida redneck peckerwood Trumpspeak, a "Koch sucker?" Putnam’s Koch attack comes one day after Trump visited Tampa to support DeSantis, in one of the lowest points of Putnam’s bid for the governor’s mansion. TALLAHASSEE — President Donald Trump’s annoyance with the Koch network is turning into Florida campaign fodder, as GOP gubernatorial candidate Adam Putnam uses it to hit Koch-backed primary foe Ron DeSantis. Trump tweeted that the “Koch Brothers” are “jokes” after the group, which has long supported free trade, criticized tariffs and other restrictive trade policies put in place by the Trump administration. 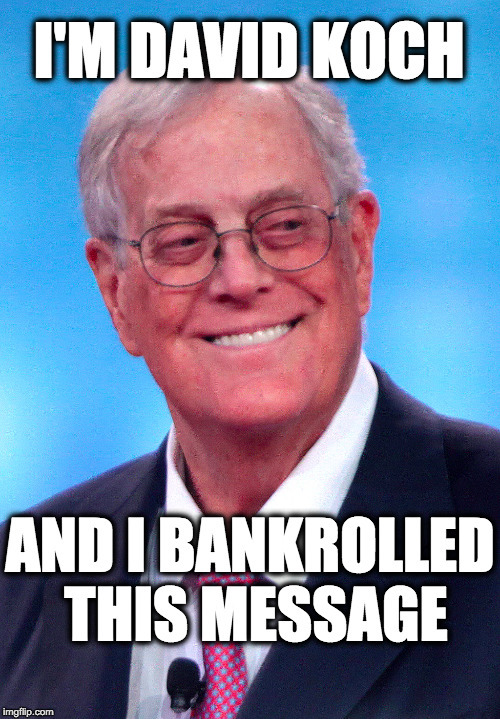 Charles and David Koch have long been collectively referred to as the Koch brothers, but David retired from Koch Industries in June. DeSantis is supported by both Trump and Freedom Partners Action Fund, a Koch network-funded group that has spent more than $240,000 through July 27 largely on a targeted mail campaign to help DeSantis. “Is DeSantis happy to accept millions from people against strengthening our borders and negotiating powerful trade deals?” Putnam’s campaign said in a statement. The Kochs have long been GOP rainmakers, but they are considering supporting Democrats as the tariffs, which they vocally oppose, gain popularity with some Republican candidates across the country. It had long been thought that donors in the Koch network would be with DeSantis, who jockeyed with state House Speaker Richard Corcoran for the group’s support early in the campaign. When it became clear Corcoran would not get their financial help, he decided not to run. Putnam, though, is considered to be associated with the establishment wing of the Florida GOP, which has not traditionally been supported by the Kochs. Putnam’s Koch attack comes one day after Trump visited Tampa to support DeSantis, in one of the lowest points of Putnam’s bid for the governor’s mansion. Many saw the rally as a death blow to his campaign, which has lost its front-runner status in recent weeks. To push back, Putnam took to Fox News, which has frequently featured DeSantis.